We filmed this lesson when we went on a trip to the Surin island together. We explained a common Thai joke as well as a new question word that you might never heard of before. I LOVE your videos! I’ve been in Thailand for a year now and I think I’ve learned more Thai in 2 days than I have all year! I do have one question? Which is appropriate to say, Can you speak Thai? Kun puut pa saa Thai “Dai Mai” or Bpen Mai? Thank you for your kind message. I am happy to hear that you found our lessons useful in your Thai learning. Thank you so much for all video you posted. 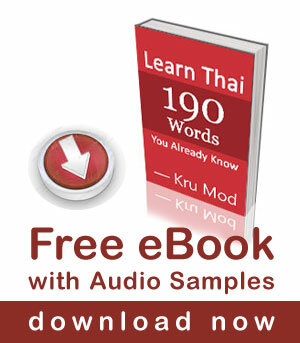 They are so useful & practical for me to learn Thai easily! So nice to see you again .Pretty lesson very useful. Hi. Thanks for interesting lesson. But It was really hard to read subtitles in video because white font on white background. Can I change this manually somehow? เสื้อชูชีพ is a ‘life’ jacket, not a live jacket. Thank you. Very good lesson. Can you snorkel or can you scuba-dive?’ in Thai structure would be “you can snorkel OR you can scuba-dive?” คุณดำน้ำตื้นเป็นหรือดำน้ำลึกเป็นนะ kun dan-náam dtûen bpen “rŭe” dam-náam lúek bpen ná? Very cool that you play the piano (assuming that wasn’t part of the act) – I do too. I am happy for you that your teaching venture seems to be going so well! Thank you Kru Mod and Kru Pear. But how do I ask my girlfriend if she wants to go swmming with me? (อยาก yàak = want, wâai-náam = swim, gàp = with, pŏm = me, mái? = question word used to form a yes/no question).